What Day Of The Week Was March 21, 1965? 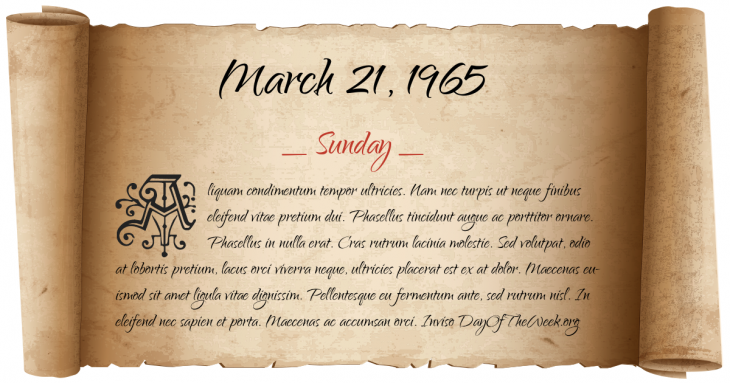 March 21, 1965 was the 80th day of the year 1965 in the Gregorian calendar. There were 285 days remaining until the end of the year. The day of the week was Sunday. A person born on this day will be 54 years old today. If that same person saved a Half dollar every day starting at age 7, then by now that person has accumulated $8,598.50 today. Martin Luther King, Jr. leads 3,200 people on the start of the third and finally successful civil rights march from Selma to Montgomery, Alabama. Ranger program: NASA launches Ranger 9 which is the last in a series of unmanned lunar space probes. Who was born on March 21, 1965?